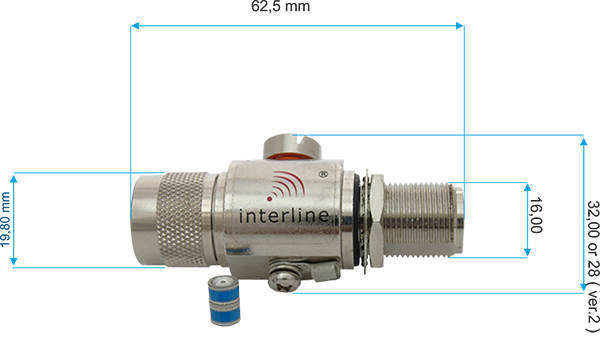 Lightning arrester end is equiped with clamp the connect grounding cable. The required wire is 4mm copper - with standard yellow-green colours. Wire must be tighten with Crimping pliers for electrical wires designed for this purpose . The other end of the cable has to to be connected to the existing lightning instalation with a resistance to ground below 5 Ω. Measurement is a measure of insulation. Capacitance PF (1MHz): ≤1. Low capacitance core gas is needed for digital signals. It does not blur the shape of digital pulses and parasitic reflections. Proper installation of an antenna with a lightning protection system is one of the key elements of the newly-built base stations and customer premises. Fastening straps stabilize the Cable led from the bottom to prevent floodwater entering the cable. 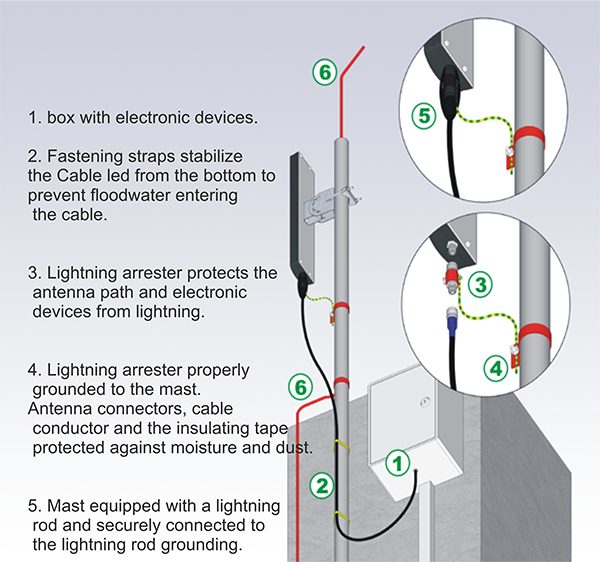 Lightning arrester protects the antenna path and electronic devices from lightning. Lightning arrester properly grounded to the mast. Antenna connectors, cable conductor and the insulating tape protected against moisture and dust. Mast equipped with a lightning rod and securely connected to the lightning rod grounding.